Lower back pain is a common health problem and nearly 80% of adults experience it at some point in their life. Low back pain is a skeletomuscular disorder and it is considered chronic if it persists for more than twelve weeks. Without proper treatment the pain tends to become chronic. Most of the causes of chronic low back pain (CLBP) are neuromusculoskeletal disorders like wrong posture, sprain in the lower back muscles, strain of soft tissues, slipped disc (herniated, or ruptured disc), sciatica ( sciatic neuritis) degenerative discs, spinal stenosis, fractures, trauma, skeletal irregularities, scoliosis, kyphosis, lordosis, osteoarthritis and osteoporosis. The options are physical, medical, and surgical methods. The focus is on causative factors, relevant pathoanatomy and pain generators and their alleviation and removal. Generally the options are non-invasive methods like initial rest, medication and exercise. In the case of traumatic injury, structural damage or structural irregularities surgical options may be resorted to. Immediate bed rest for less than two days helps in the lessening of chronic pain and inflammation. However bed rest for longer period does not have increased benefits. Prolonged bed rest can be counterproductive. In fact prolonged bed rest can have deleterious effects by weakening the supportive muscles and leading to progressive hypo mobility of joints and prolonged recovery. Physiotherapy comprises a mixture of any of the methods like interferential treatment, laser, lumbar supports, shortwave diathermy, therapeutic ultrasound, hot/cold packs, traction, transcutaneous electrical nerve stimulation (TENS), massage and mobilization Though there may be marginal momentary reduction in low back pain there are no long term positive effects and advantages. show lasting improvement in chronic low back pain reduction and function. These exercises do not require expensive training equipment. Muscle strengthening, muscle conditioning, aerobic, flexion, Alexander Technique and McKenzie exercises may be tried as per the preference of both the patient and therapist. Manual treatment comprises spinal manipulation and spinal mobilization The spinal manipulation is small amplitude high velocity thrust technique. 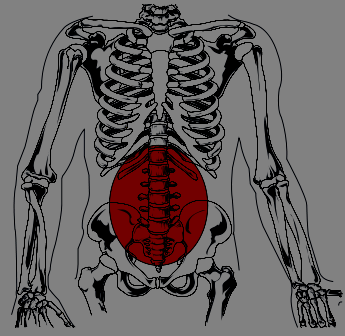 It is usually a rapid movement beyond the movement range of the affected back joint. The patient has no control over the manipulation and the technique is prone to complications if done by persons lacking expertise. Spinal mobilization is use of passive low-velocity movements to give mobility to a joint. Excluding movements that would further strain the lower back, mobilization within the limits of low back pain aids recovery. Mobilization techniques show improvement in pain reduction, motor activity and sympathetic nervous system activity. As the patient has control over the movement, this technique is considered as far safer to manipulation technique. Non Steroidal Anti Inflammatory Drugs (NSAIDs) are widely prescribed for their pain-killing potential and also for their anti-inflammatory action. The side-effects of NSAIDs are gastrointestinal complications like irritation, gastric ulcers and intestinal bleeding. Some NASIDs like rofecoxib have serious long-term effects like increases cardiovascular risk. Hence for long term use individual case has to be monitored. Noradrenergic and noradrenergic-serotonergic antidepressants have been found to be moderately effective in reducing chronic pain in CLBP patients and quite effective when used as co-medication with NSAIDs. In patients with kidney diseases, glaucoma, chronic obstructive pulmonary disease and heart failure antidepressants should be avoided. Pregnant patients with chronic pain should not be given antidepressants without closely monitoring their health. Opioid are short-term treatment for pain and disability in chronic low back pain. Weak opioid are prescribed only for short-term treatment as there is the risk of development of dependence and addiction. To avoid addiction, slow release opioid can be given. Muscle relaxants like benzodiazepines are used for the short-term reduction from pain. However they have the side effects like allergy, addiction, drowsiness, dizziness and impaired liver function in the long run. Capsicum pain plasters have capsaicin from chilli peppers which reduces low back pain. Hence application of capsicum pain plasters is an effective short-term treatment for CLBP. Surgery for pain reduction is resorted to when all other conservative treatments have become ineffective in reducing of pain. Surgical treatments for chronic low back pain include lumbar microdiscectomy, discectomy (involving partial or complete excision of an intervertebral disk), laminectomy (removal of portion of the vertebral bone called the lamina), foraminotomy (performed to reduce the symptoms of nerve root compression), disc replacement surgery or spinal fusion. Spinal fusion surgery is considered in case of degenerative disc disease, facet joint degeneration or spinal instability and it aims at obtaining solid fusion of two or more affected vertebrae to give stability. As spinal fusion surgery has high rate of complications it may be performed only if the CLBP persists for more than two years and also in case of failed conservative treatments and severe pain. Back school is a combination of education and skill program aimed to lower the chronic LBP. There are some short-term positive results. However there may not be any long-term benefit. Brief educational interventions to promote self treatment by the patient can be given by the physiotherapist or physician to reduce disability and sickness. Brief educational interventions should provide reassurance and positive messages that encourage the patient to return to normal activities. Cognitive-behavioral treatment methods are effective for chronic pain, functional status and behavioral outcomes. Intensive multidisciplinary biopsychosocial rehabilitation treatment program consisting of combination of physical, pharmacological, vocational, and behavioral components are very effective in alleviating the chronic LBP and improving the functionality, especially in patients who have failed mono-disciplinary treatment options. Neuro-Reflexotherapy has been effective in the treatment of chronic low back pain. Short-term treatment can be taken up to lower chronic pain. Percutaneous electrical nerve stimulation (PENS) are effective in reduction of chronic low back pain. Back pain from heavy backpacks - Prevention in children. Pneumonia in children and infants - Signs, symptoms & causes. Chronic sinusitis - balloon sinuplasty. 2.Karjalainen K, Malmivaara A, van Tulder M, et al. Multidisciplinary biopsychosocial rehabilitation for subacute low back pain among working age adults. Cochrane Database Syst Rev. 2003;(2):CD002193.